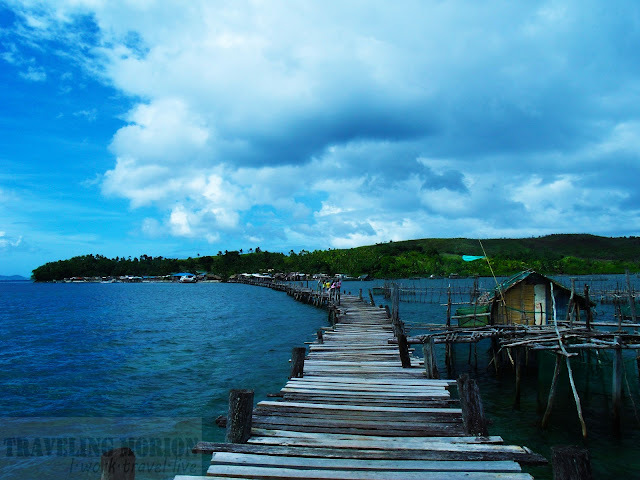 Just imagine the feeling while walking and crossing the two islands by wooden footbridge - breathing the freshest air; witnessing the majestic blue and green view that surrounds; and the excitement every-time the waves strike below your feet... Sarap! 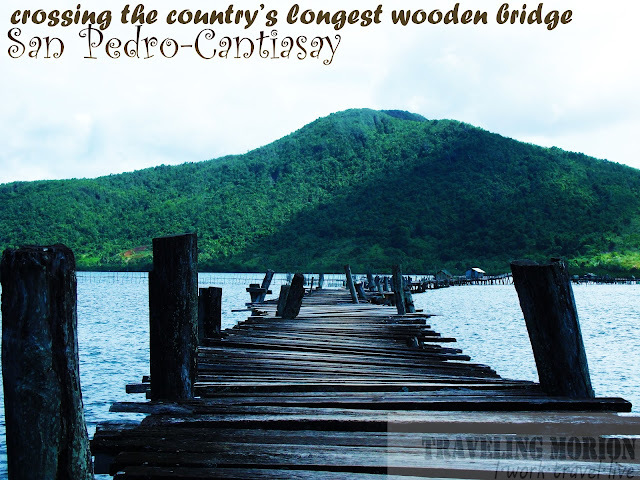 Have you ever heard or read something about the Philippines' longest wooden bridge? 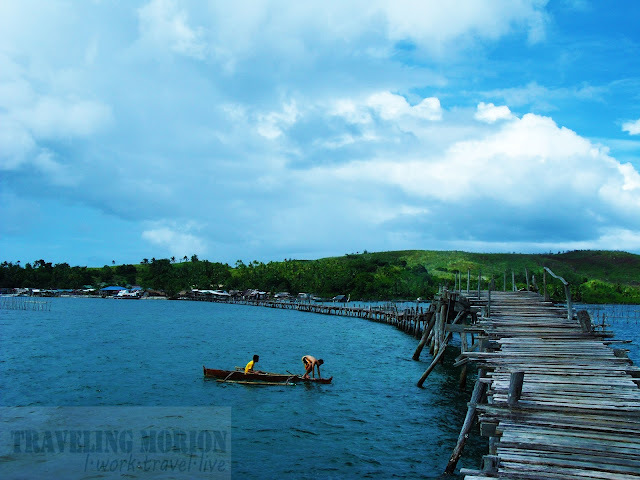 Yes, longest wooden bridge at 391 meters strip connecting the two islands in Surigao City. 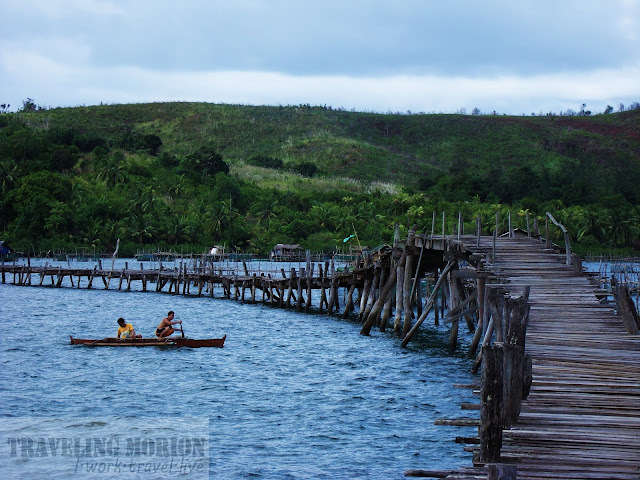 Tagged as Surigao’s version of the famed San Juanico Bridge of Samar-Leyte Province, The Cantiasay - San Pedro wooden bridge connects villages of San Pedro in Hanigad Island and Cantiasay in Nonoc Island. Tambay mode in a coffee shop in Manila updating this blog when a photograph of an old, long, and lovely wooden bridge caught my attention. 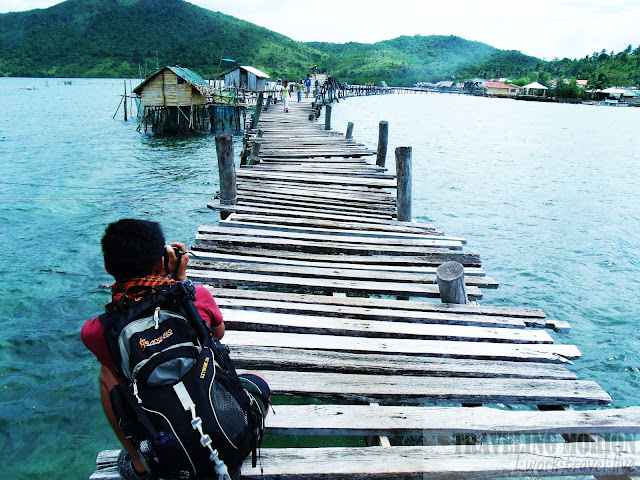 Then, I remember a fellow travel blogger sharing about the longest wooden bridge in the country located in Surigao City, my new area of work assignment this year. 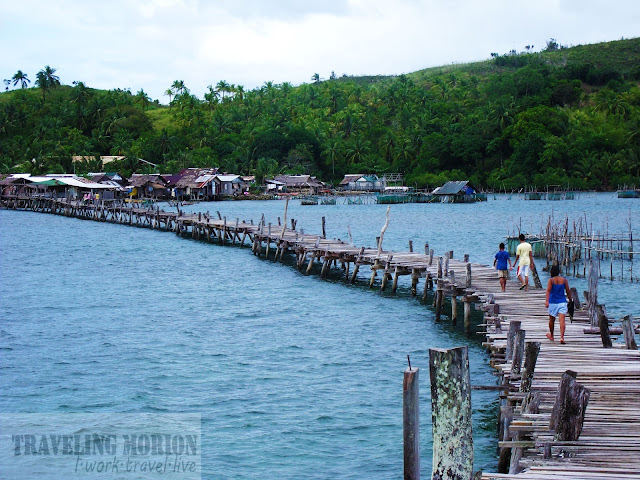 Hindi pwedeng hindi ko mapuntahan yang longest wooden bridge na yan, sayang ang moment na nasa Surigao na rin lang naman ako:)”. Timing! Two days ahead at that time, I am scheduled to go back in Mindanao for the usual work itineraries and of course "sidetrips" hehehe. So I've posted in my blog’s FB Fan Page wall that I am planning to explore the said wooden bridge on the second Saturday of November. Got some THUMBS UP and of course comments including from my fellow travel bloggers Nathalie of Wandering Soles (the Lady in long gown with zwarovsky crystals- tama ba spelling? :) and Dennis of Love Mindanao (the CONFI) hahaha PEACE PEACE. So wala na tong urungan:) as the “kaladkaring" Love Mindanao (his new tag) already confirmed he's joining me, while Nathalie can’t make it because of her travel in Davao scheduled prior to this. Sir Nick Amores of Surigao City Tourism Council also commented and gave us some info./ guide on how to go to Barangay Cantiasay and suggested other interesting spots in Surigao City. So this is it! Saturday Morning, Love Mindanao and I meet in Surigao City Integrated Terminal Passengers' Area. He’s from a long bus trip - from Surigao del Sur. We just have had our breakfast in the famous food chain with cute, hug-gable jolly mascot then proceed to the boulevard area. Unfortunately, we found out that the passenger boat going to Cantiasay will be leaving by 12:00NOON pa - according to one of the crews. We also asked if there are also scheduled trip going back to Surigao City from 12:00NOON to 4:00PM. "Wala na, kinabukasan pa ng maaga" he replied. So it is not possible for us to go back to Surigao City in the afternoon if we will take the public transport. Considering my early morning activities on Sunday, we decided to find a fisherman with motorized banka for hire whose willing to service us going back and forth to Cantiasay. 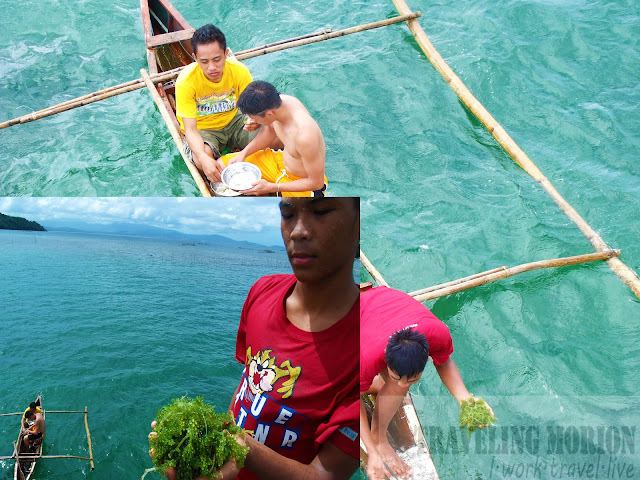 A local vendor advised us to go to Barangay Taft's Wharf Area, where some fishermen are usually resting in the morning and willing to service tourists for island hopping and other island activities. The wharf is a tricycle ride from the boulevard area. After a good negotiation (and haggling), Manong Eddie, a local fisherman from Barangay Taft, agreed for 1200 pesos rate - that's already good for back and forth trip to Cantiasay. 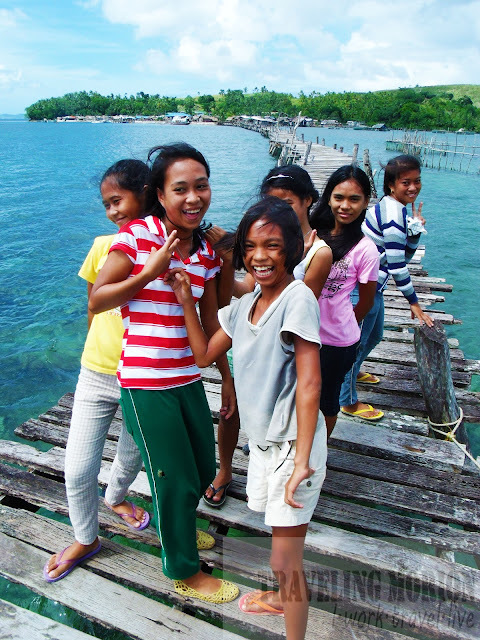 We arrive in Barangay San Pedro's wharf around 10:00AM. Sweet smile of of the locals - that's the best welcome! 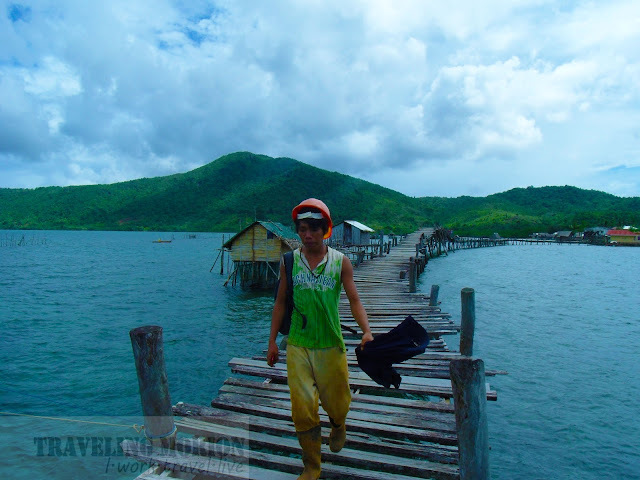 It took us almost an hour to cross the 391 meters wooden bridge. We enjoyed taking shots of never-ending subjects and sceneries. The clear sky and beautiful clouds is a perfect view; the backdrop mountains and greens is a refreshing sight; the calm sea mesmerized my soul - this place is a hidden paradise! Going home. Worker of a mining company kilometers away from Bo. Cantiasay. According to Ate Elena, Barangay Kagawad in Cantiasay and our ever accommodating host, the name of their Barangay was derived from the name of her grandmother, “Asay” plus the words “Tiya”, a local dialect similarly/closely means “Impo” that is pronounced before the first name or nickname as sign of respect and "Kang" which mean "Kay" in Tagalog or To in English. 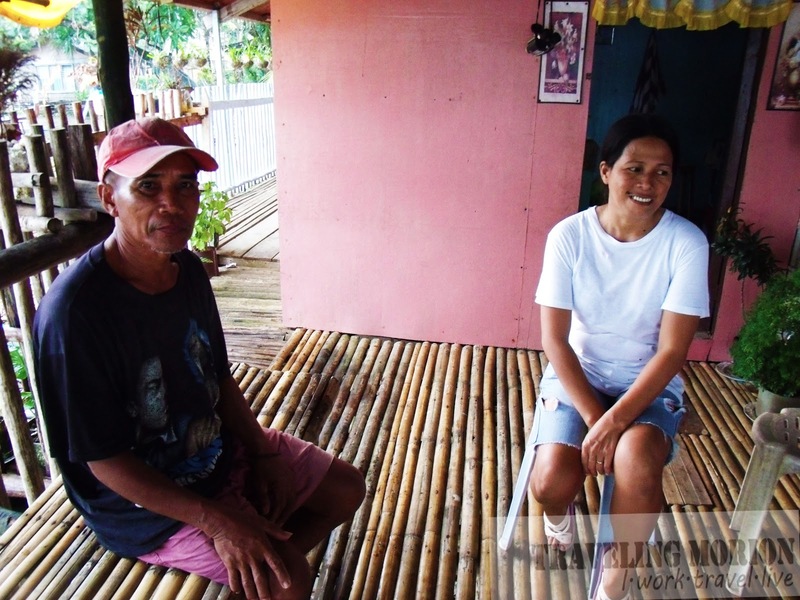 Tiya Asay is the only traditional doctor or albularyo during early times servicing locals of the two island Barangays. If there are people looking for traditional doctor or albularyo they will just say "Kang Tiya Asay" or Kay Tiya Asay in Tagalog. The construction of the said wooden bridge started in 1979. Currently, the maintenance of the said wooden bridge is under the responsibility of the city government of Surigao. There is no electric company or cooperative servicing the area. The locals are hopeful that the planned electrification project in the area by an electric cooperative from Dinagat Province would be turned into reality next year. They only have one (1) big generator set servicing the 2 islands but, only running from 6:00PM to 10:00PM – in time for watching news and teleserye’s according to Ate Elena. I would like to express my warmest "Thank You!" to the Barangay officials and locals of Barangay Cantiasay for accommodating us during our short stay in the island. Special mention to Kagawad Elena! Thank you also to Sir Richard Nick Amores of Surigao City Tourism Council and Mt. Baragabon Resort and Hotel for the support! 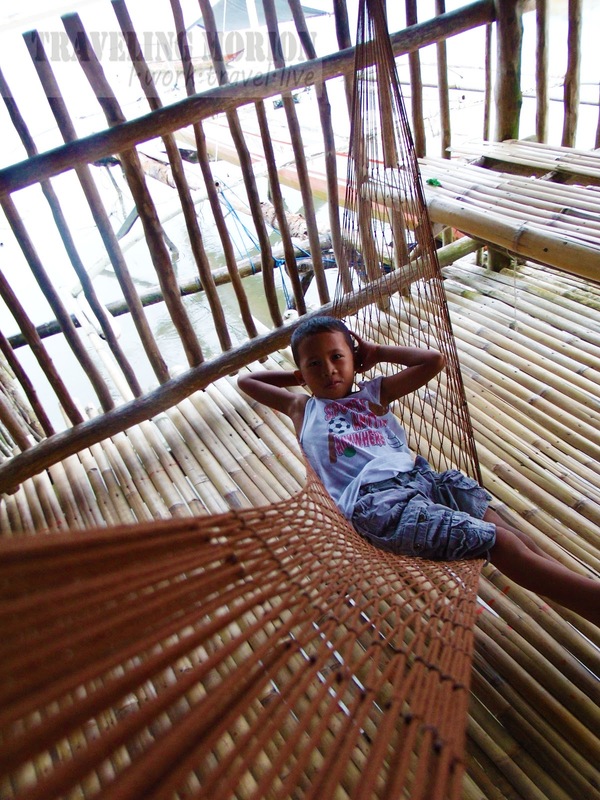 Plan your trip now going to “The City of Island Adventures” - Surigao City! Don’t forget to include Cantiasay - San Pedro Wooden Footbridge on your itinerary. Take a tricycle/multicab going to the Boulevard Area of Surigao City. Fare costs 9-11 pesos. Scheduled passenger-boat leaves Surigao Boulevard going to San Pedro Wharf of Hanigad Island around 12:00N. Return trip would be on the following day. The boat leaves San Pedro Wharf around 7:00-8:00AM, going to Surigao City Boulevard. 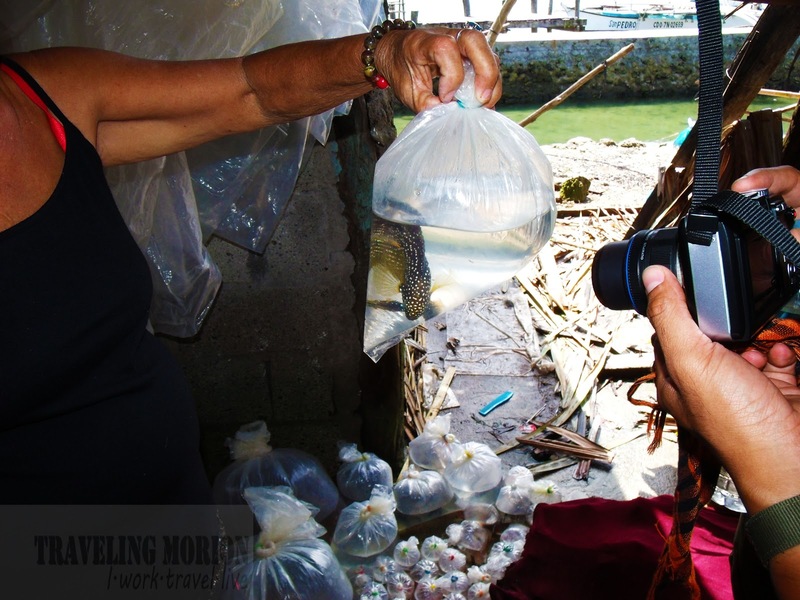 But if your plan is a day tour, just like ours, go to the wharf in Barangay Taft and look for a motorized boat for hire - don''t forget to haggle. Cost for back and forth travel is around 1200-1500 pesos. From Surigao Boulevard travel time going to Cantiasay is less than an hour. P.S. 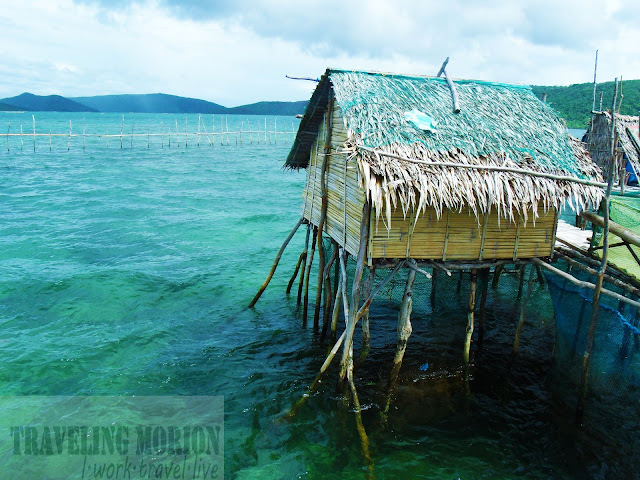 If you want to hire a motorized banka/boat, I highly recommend Kuya Eddie. Call or text him ahead in this number: 09302667895. Currently, there are no Inns, pension houses or hotels in the area. 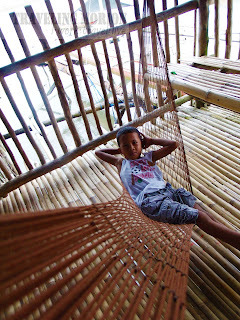 Camping/tent and home stay are the only possible way to stay overnight in the islands. You can call or text the ever hospitable Ate Elena at least two (2) days ahead. She’s very much willing to accommodate travelers and visitors. Her cellular phone number is 09127445635. Also, don’t forget to pay courtesy call to the Barangay Captain. He is willing also to accommodate and give guide to island visitors and travelers. "your travel pal in Surigao"
thanks for dropping here filipinawanderer.visit this place, ganda! - yung pagatwid sa tulay na yun di na pedeng pantayan ng ilang beses n halaga..
inggit much! lang ako! gusto ko din tumwid dyan at magpaphotoshoot sayo! Eto lang ang masasabi ko: "Inggit much!" how deep is the water? the bridge looks interesting, but what if it collapses while people are walking on it? i have been on a similar one in Canada, and that one was wobbly and high. we were walking on it very slow. 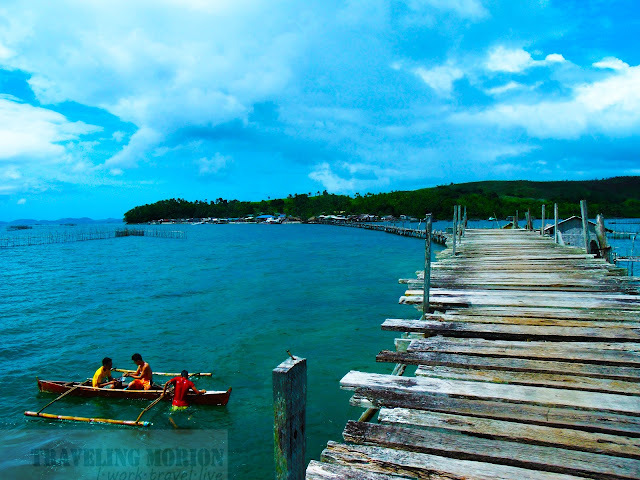 I used to live in Mainit, Surigao del Norte for 5 years but I haven't been able to visit Cantiasay. I'm afraid, I might lose balance crossing this bridge. Wow... Ang astig nung bridge... Mas magiging maganda siguro pag may Ilaw na sila then magkakaroon ng "bridge light" ... Ang Ganda siguro ng effect sa gabi nun!!!! Initially, I thought it was a post about San Juanico Bridge bu it turned up it's something even more unique as San Juanico which is the longest wooden bridge. This must have been an exhilarating experience. Wow! ang haba talaga ng tulay. It will be a great experience for me to cross that bridge. Astig!!! Hindi kaya delikado dyan kapag marami kayo? I like the new update in your blog. And this new feature takes it all. Would be nice to try homestay, and I'd love to take a photograph of this longest wooden bridge on a goodlight. I bet its a great view. Amazing shot of the longest wooden bridge.. I wonder if it will also deteriorate? 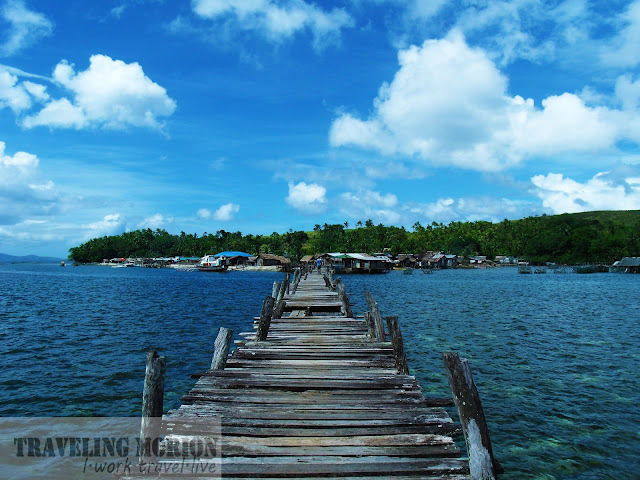 You have to take chances while you are in Surigao. Opportunity knocks once.....at kung makabalik man, matagal pa....Paano kaya kung rotten na ang foot bridge na yan, Jeff? Wood if exposed to the sea waves, hindi kaya madaling mag rot? Curious lang jeff....at maganda catch ito. Wonderfully taken shots. The long bridge is kinda scary to cross pero exciting naman din ,need lang kaholding hands para feel safe while crossing. Ang ganda. Great find. Pang documentary. Great! That's so interesting. I never thought we have a wooden bridge that long and it's already 33 years old! kasali talaga ang long gown na yan..hahaha thank you for mentioning my link, free ad hehehe Next time overnight/camping nman tayo in one of the islands. speaking of abundance in natural resources... i just hope people would learn to treasure and protect them. Yahweh bless. The place looks great! Not sure if I'd be able to cross that bridge tho. Wow! Amazing place! Would love to explore Surigao again, hopefully soon! Wow Nice photographs!!! .. Great to tourist destination.....!!! howow! ang ganda, sana makapunta ako dyan soon.... i like the wagas smiles and my favorite Lato..sarap. This must be a really exciting bridge to cross because its longer than any wooden bridge I saw! now this is really quite an exciting travel escapade one ought to experience if he happens to traverse in this side of the country. It's quite scary to cross in the wooden bridge but I always want to try something new. I think this would be so much fun! Ang ganda ng bridge.even yung view. Though I cannot help but notice yung bahay nila. uhmm.this may be off topic Q pero, how do they keep the waters clean there? Do they have yung tapunan ng basura or do they throw their garbage there? Parang nakakatakot namang lumakad diyan, wala man lang railings sa side at yung wooden steps hindi pantay-pantay baka bumigay. I like the photo shots. I think it is scary to walk in the wooden bridge especially when it is raining but the village beside looks so refreshing to live in. Great shots. But I wonder if that bridge can stand surge of storm and waves. Wow long wooden bridge. I don't think I have the guts to cross that bridge. By just looking at it my nerves are started trembling. I love what I am seeing, traditional yet worth visiting. Nagtatanong lang po.. sa gabi ano ang lighting system nila? I went their last 2010 pa di ko man lang nabisita ang mga yan. Is this bridge still standing after the earthquake?